It took me a while to figure out that you had to click on BS and then hit the little arrow at the bottom of the screen to get to Channel 34, so I missed the first 14 min. (2 songs), but I watched the rest of the three-hour spectacle with no problem. I'll post pix later. Masaki gave what I believe is the longest address to a graduating member in the group's history. And what a fast talker! I noted that five members shed no tears during the ceremony: Kaga, Miki, Ogata, Masaki, Erina. Setlist is actually just the same as one of the regular setlists, with albums 4 and 9 used for the medley that changes, so I won't post it here. Only change was that she did Moshimo... as her solo. The announcement was over six months ago, so I stopped caring ages ago. Especially because her graduation single was TWO months ago. It hurts more if they announce it like one month before the tour actually starts. I abhor orange but I actually think this dress is pretty cute lol. It reminds me of something you'd see in a 70's magical girl anime or something. Yeah, this graduation feels almost... anti-climactic, just because it was announced so far in advance. Then again, wasn't Sayumi's also announced far in advance? Unless I'm remembering wrong. But Sayumi definitely had a far bigger presence than Kudo, who I never felt was able to reach her full potential. Yeah, that was also my feeling. I liked Kudo a lot as a member, but I feel she might have had a better presence if she stayed for a year or two longer. Becoming leader or subleader. But that concert setlist... there were some real mood killers in the middle of the concert. After that everything fell pretty flat. It was but I also had stopped caring about hers too by the time it happened. The concert's up on at least two different places, so I managed to watch the opening and songs that I'd missed. There was this great film montage that opened the show where they wear these nifty outfits, so what do they come out in for "Wagamama..."? Big, bulky theatrical costumes (like something out of Ribon no Kishi), with coats and long cloaks--the wrong kind of thing to wear doing high-energy song-and-dance numbers under hot lights. Why didn't they wear the costumes they wore in the montage? Is it just me or does Haruka look like Lightning from FFXIII in that opening outfit? As for why they didn't pick this set of outfits... I have no idea. It's a tossup as to when and if the promotional outfits are concert ready. Maybe it depends on walkability or the concern that accessories could get caught on something. the member color outfits for 2012 fall and Reina's graduation. the pink-camo ones were used in Sayu's graduation. the white outfits were trotted out in the encore for 2015 spring. 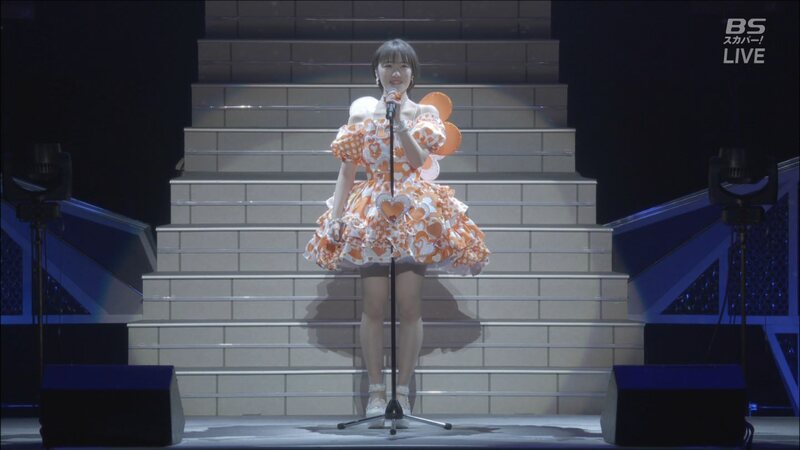 the "fashion outfits" were brought out midway through Suzuki Kanon's graduation run. the Vision outfits were used everywhere in the end of 2016 (I think this board talked about it). the Prism tour (Riho's graduation) was a mess all over the place as the promo outfits were only used for the calendar and they borrowed Imasugu outfits for the actual advertising (like billboards and flyers). Inspiration's flower-girl promo outfits were never used. 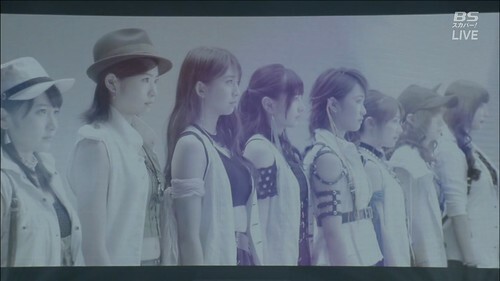 Regarding graduation fatigue: Don't forget this year there were the earlier planned graduations of C-ute and Momoko, and they symbolised the end of an era. Duu's graduation by contrast doesn't really change the member dynamics too much. And then, there were all of the unexpected announcements: CG's effective hiatus, Ruru and Kawamoo's promotions, Ichioka Reina's new group, Kobushigeddon... this has definitely been a busy year for H!P on top of the lengthier CD single promotions and Tsubaki's debut. It's almost no wonder they didn't have time to make the 20th Anniversary even more of a splash. If Duu had just waited another 6 months for things to calm down or SOMEONE could have made a convention appearance, there might have been more buzz here Stateside. But maybe that extra six months was really crucial for Duu's career, I don't know. Regardless, it's what it is. On the other hand, goods-side it's been non-stop. For all those efforts of Mizuki and Teddy and Maria putting out photobooks, the level of Wanibooks' support for Duu was easily the best I've ever seen (and that includes all those camera books that Sayu did). This concert had 9 DVD magazines, 2 of were just devoted to the Haru-sempai serialization, plus 4?5? volumes of the Wanibooks magazine. Call Riho an ace but I doubt she had even that level of photoshoot power (maybe this is a good thing). It was... OK, I guess? Endless Sky was a definite tear-jerker but everything else was fairly standard. The camera didn't catch any shenanigans so I can't say much, but that wHaruna/Kaede MC was pretty good. (It was about their complete lack of compatibility with each other). The setlist was a combination of standard group songs rather than member-split ups, and while I totally agree with the choice of encore songs (Wakaindashi, Pyoko Pyoko, and Namidacchi), they weren't as classic crowdpleasers like Koko ni Iruzee or Happy Daisakusen. And, I wish they could have used the runway more. The latest rumor is that Haruka will be the Yellow Ranger in the next sentai season. Can anyone confirm? Thanks. Unfortunately I can't confirm it as the cast is not out yet. The rumor is that the Yellow Ranger is an 18 year old former idol, which would fit Duu, but other sources seem to favor Aoshima Kokoro. Du's grad outfit is cute. One of the best MM grad outfits I can remember. I agree. Only ones I think of I liked more are Gaki's (and I don't even like green) and Eri's ones, and this one is be tied with Reina's in my mind. (Next are Riho's and Koha-chan's ones). But I'm disappointed by her graduation song's choice : she already sang it multiple times but didn't have that many others chances to sing solos otherwise so I would have loved to listen to her on another song. One of the best graduation costumes, hands down. I love it.